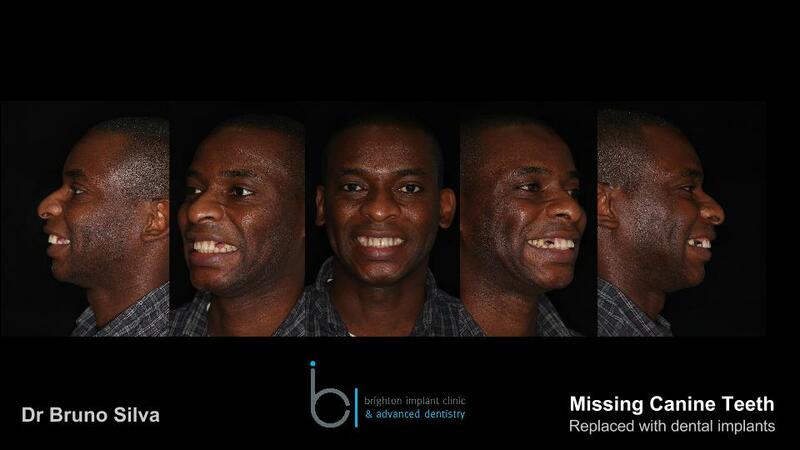 A gentleman presented at our clinic complaining of missing canine teeth. 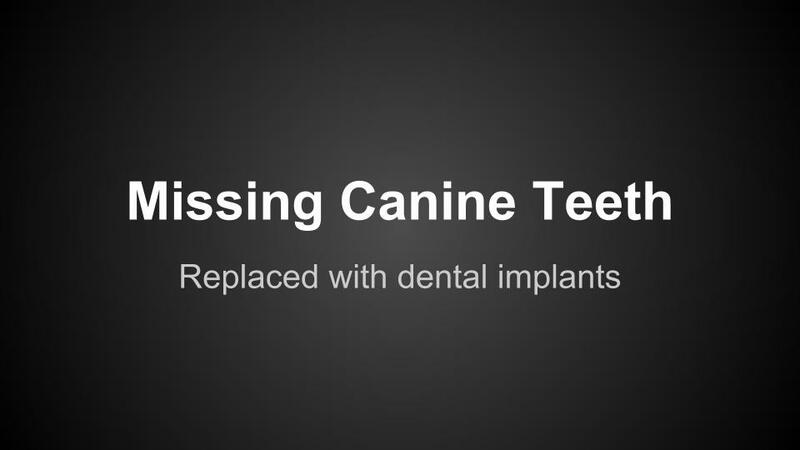 The missing canines had been missing for some time and he used a partial removable denture to replace the teeth. 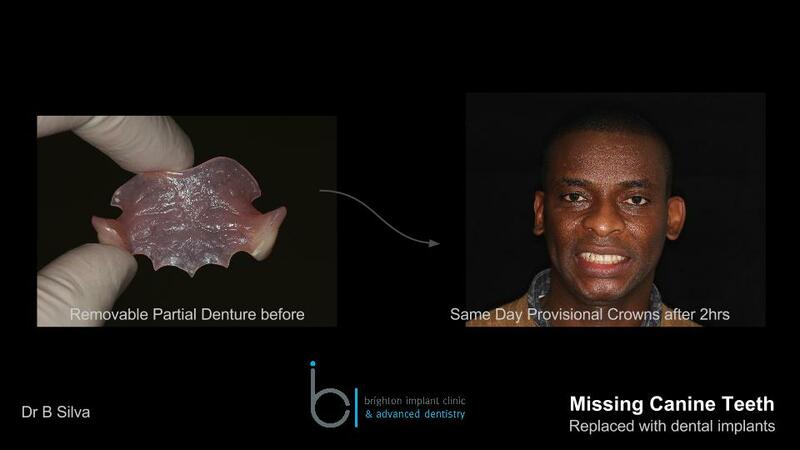 He found the removable denture to be somewhat uncomfortable and did not like the way that it moved during speech and while eating. 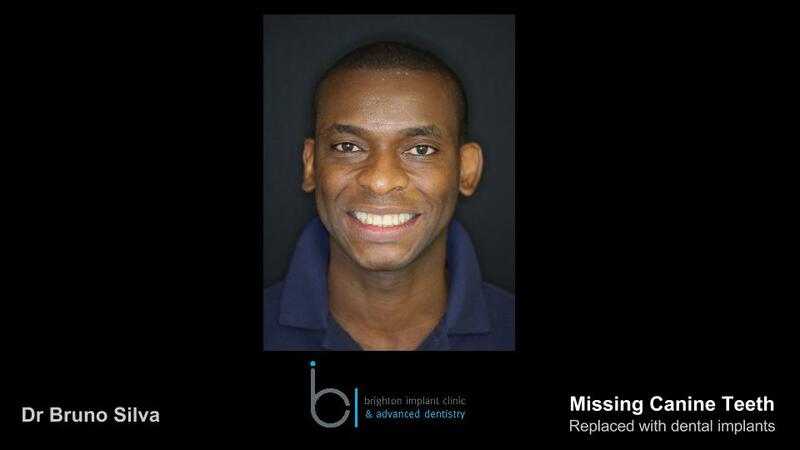 Apart from the missing teeth he had good oral health, visited the dentist regularly and was in good health. 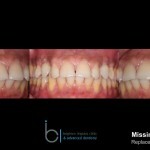 A thorough implant assessment was carried out and the options of treatment discussed with the patient. 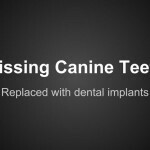 The spaces that were present from the missing canine teeth were slightly wider than the normal space of a canine tooth. 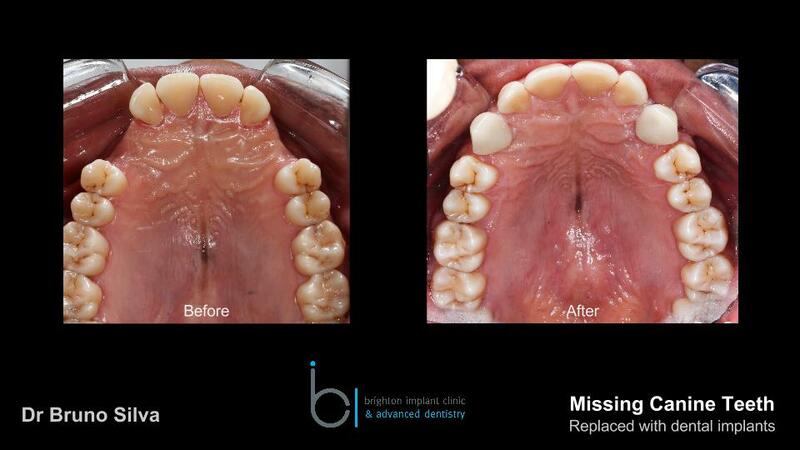 Orthodontic treatment was discussed with the patient and the possibility of closing the spaces was considered. 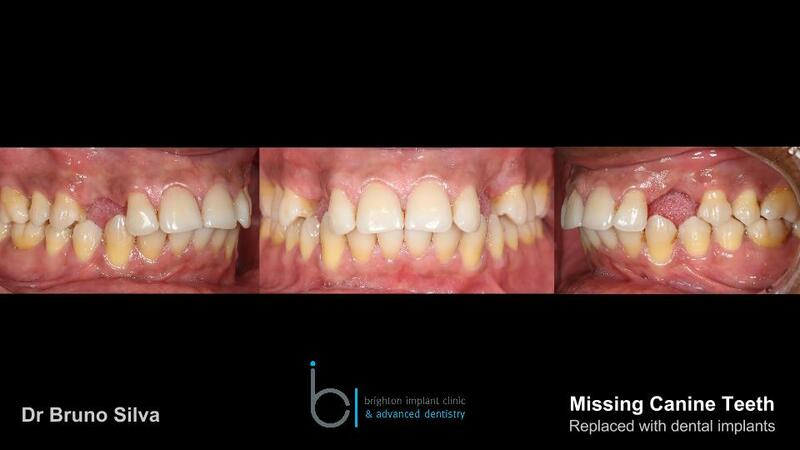 The patient opted to simply replace the missing teeth with a fixed restoration. Two options were discussed. 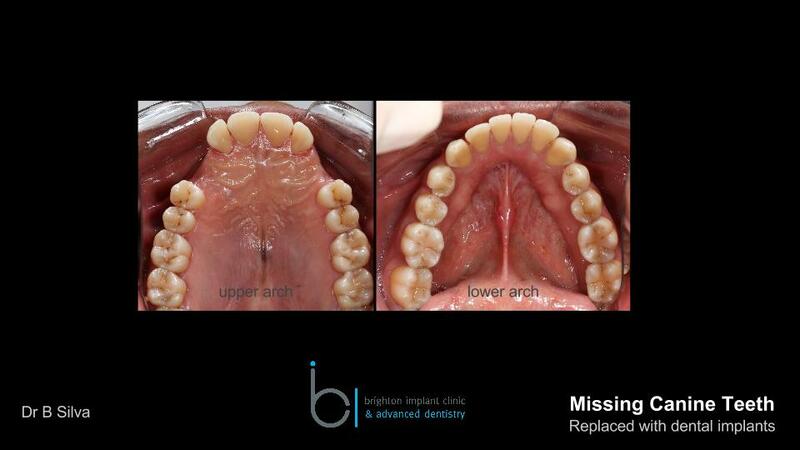 Fixed bridge work on natural teeth. 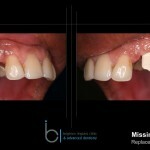 This option would involve preparation of the teeth on either side to accept the fixed bridge. 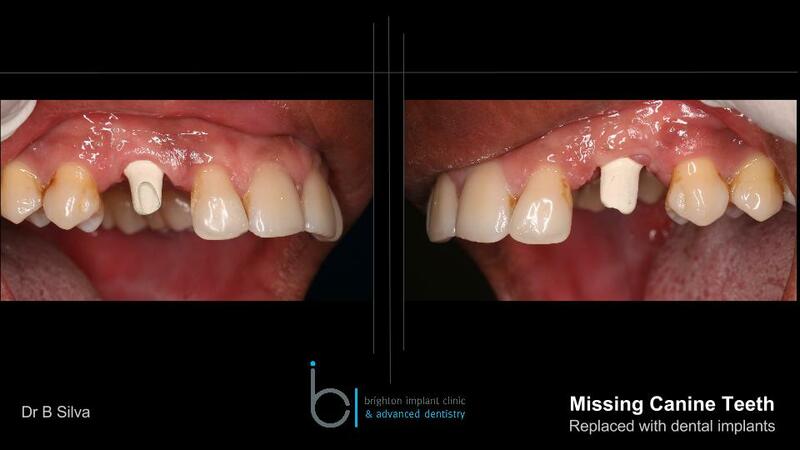 The preparation requires the reduction of the natural teeth in order to form a support for the fixed bridge. 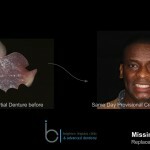 This preparation can harm a tooth as the protective layer is removed during the preparation. 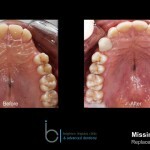 The fact that the space was also wider than a canine tooth coupled with the risk of long term tooth damage would mean that a fixed bridge would not be an ideal solution. 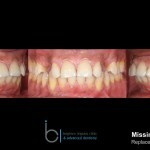 Dental implants was the option as this meant that the teeth on either side of the space did not need preparation. 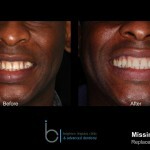 The implants would be placed into the jaw bone and the teeth would be made of proportionate size. 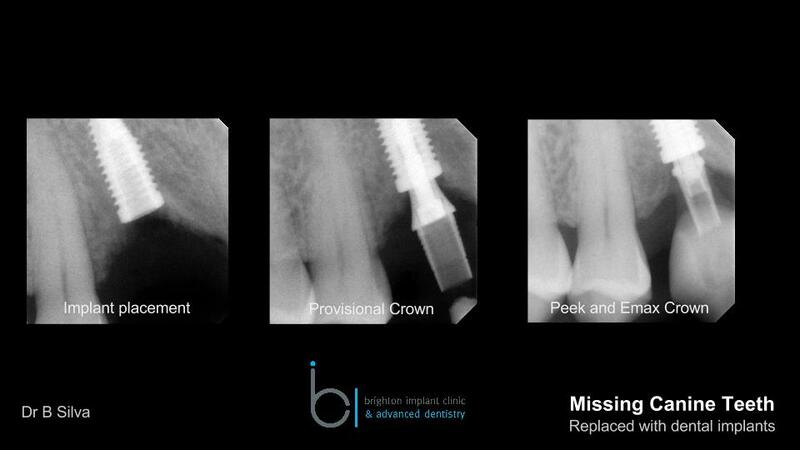 A small space on either side of the dental implant canine crowns would be made. 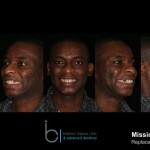 The patient decided to go ahead with dental implant treatment. 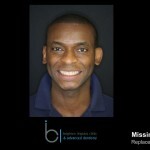 The procedure was carried out under sedation and the implants inserted during a 1.5 hour procedure. 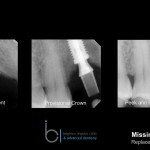 Immediately following the surgery provisional crowns were made and fitted onto the implants. 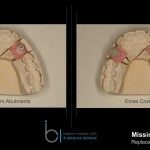 This is only possible where the implants are placed into dense bone and the implants are 'stable' or 'secure' enough to support teeth. 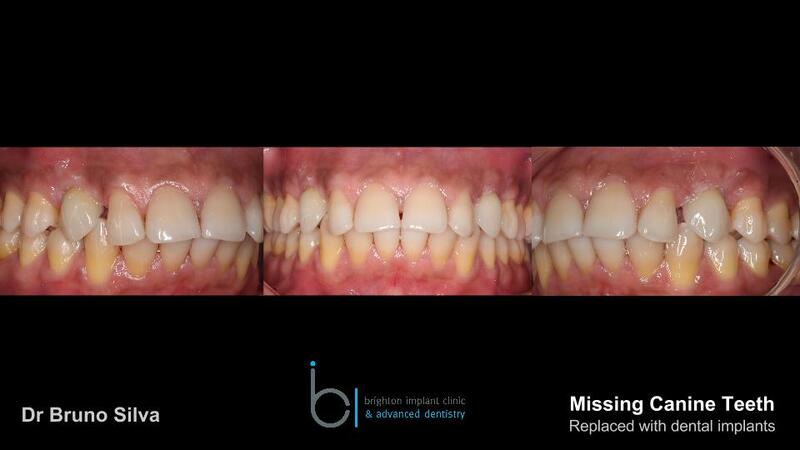 The provisional crowns were used during a 4 month healing phase. 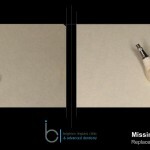 This healing phase is where the titanium implants actually fuse with the bone tissue. 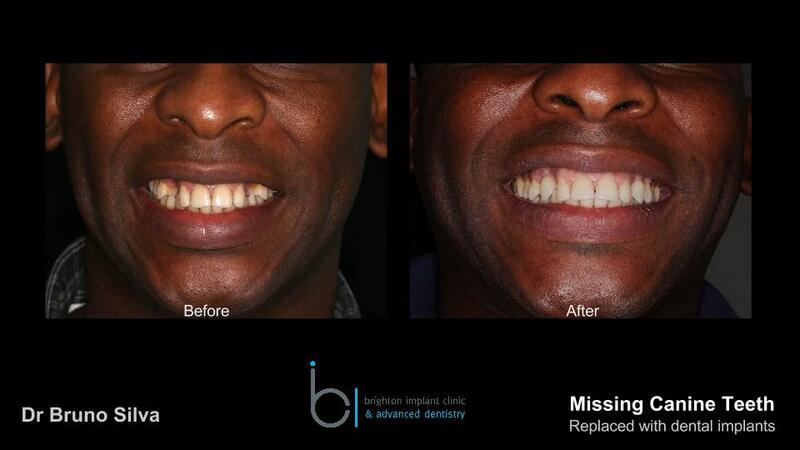 This process is known as osseo-intetration. 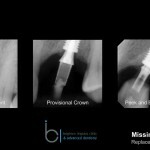 After the implants were verified to have been successful, final impressions were taken for the definitive/final crowns. 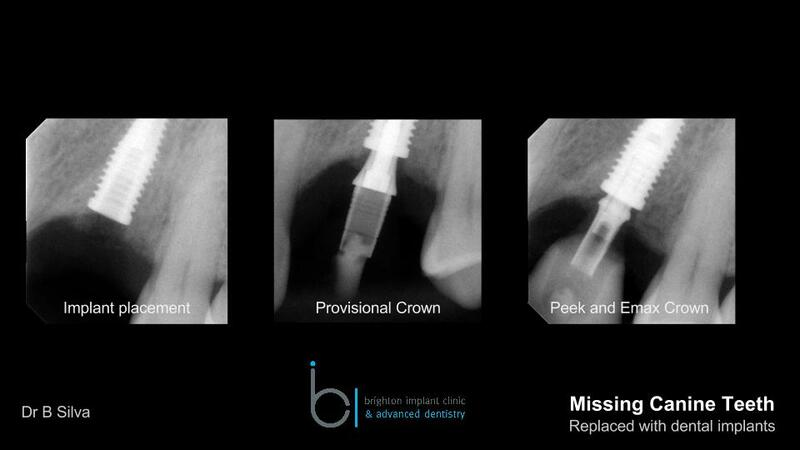 We opted to use PEEK on titanium abutments. 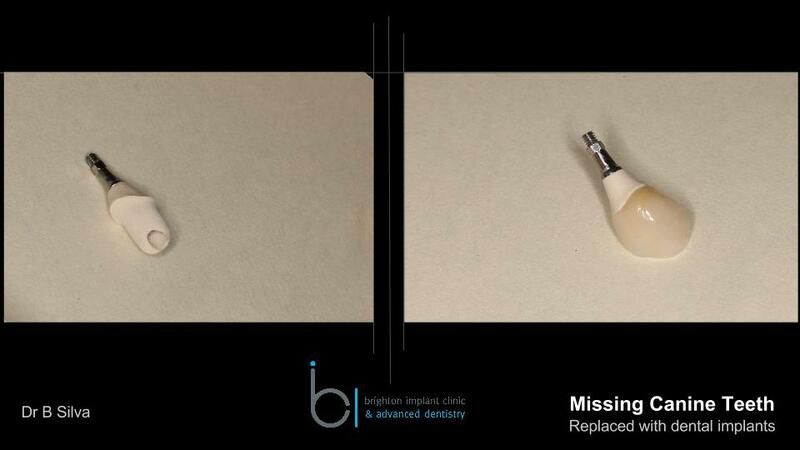 This allowed for a customized abutment to be the ideal shape of the gum tissues. 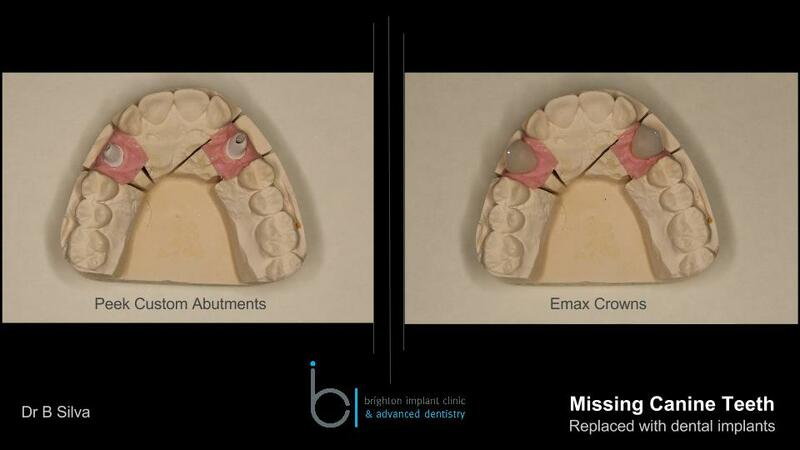 The crowns were made of Emax ceramic which has excellent light translucency and has excellent aesthetics for natural looking teeth.